For the last few posts I have been rather egotistically rabbiting on about C and my move to Brazil. However, something that you guys might not have been aware of is that we did in fact up-root two other little lives with us as well! 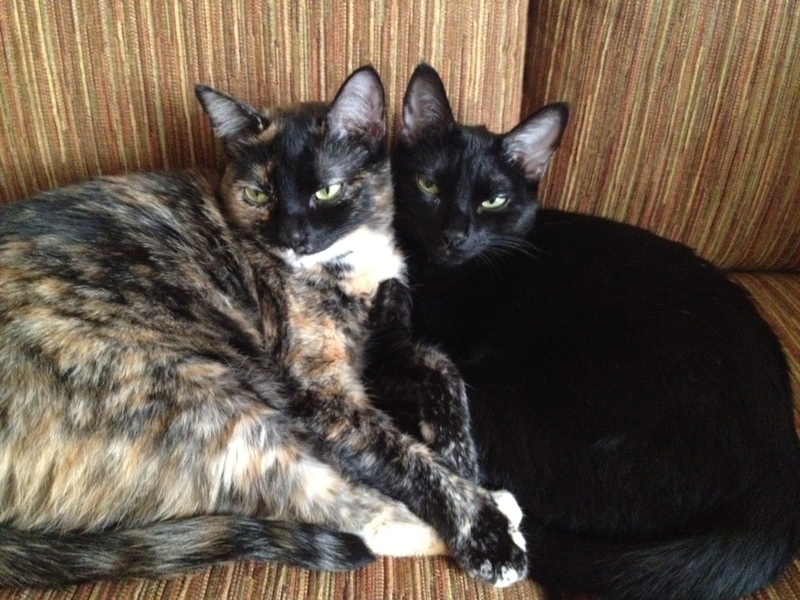 Meet Khloe and Pixie, our two Mexican Beauties (admittedly one is more of a beauty than the other…). If there has been one element of this move that has stressed me out more, or caused me more anxiety – it has been the wellbeing of these cats. There are just so many aspects to take into consideration when moving with a pet, that the prospect of it was incredibly daunting. All the paperwork that needed to be filled out, all the vet visits, all the bureaucratic loops that need to be jumped, not to mention the cat’s actual welfare to worry about. For those of you who are planning on travelling with your cat, and are as worried as I was, I thought I would share my experience with you, to give you an idea of what it is like and what to expect. 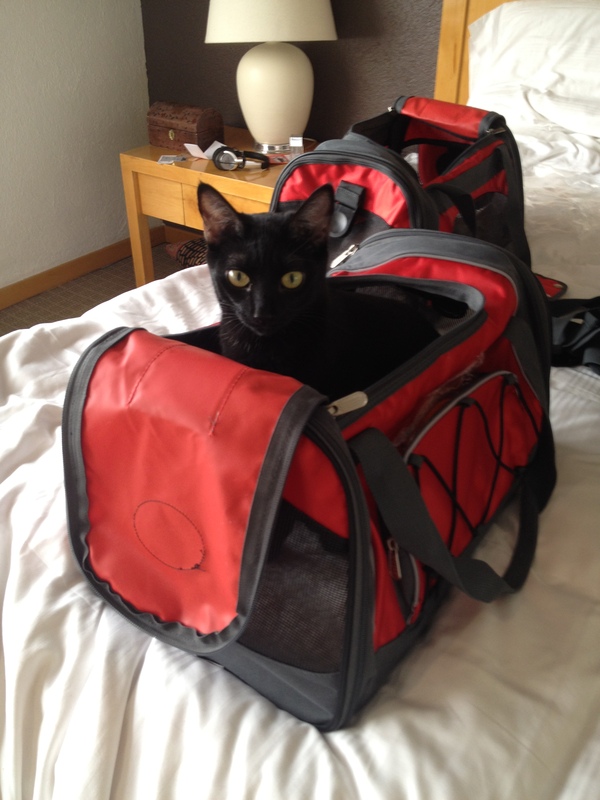 Preparation is King: The minute you find out you are moving overseas and your pets are coming with you – start to plan! Find out exactly what paperwork you need both from the government in your current country and the government in the new country. Moving to Brazil was exceptionally challenging. There was a lot of paperwork and authentication that needed to be done, some of it right up until the morning we left! Do your homework: Figure out how you are going to transport them to your new location. C and I were very adamant that if we could take them on the plane with us, we would. 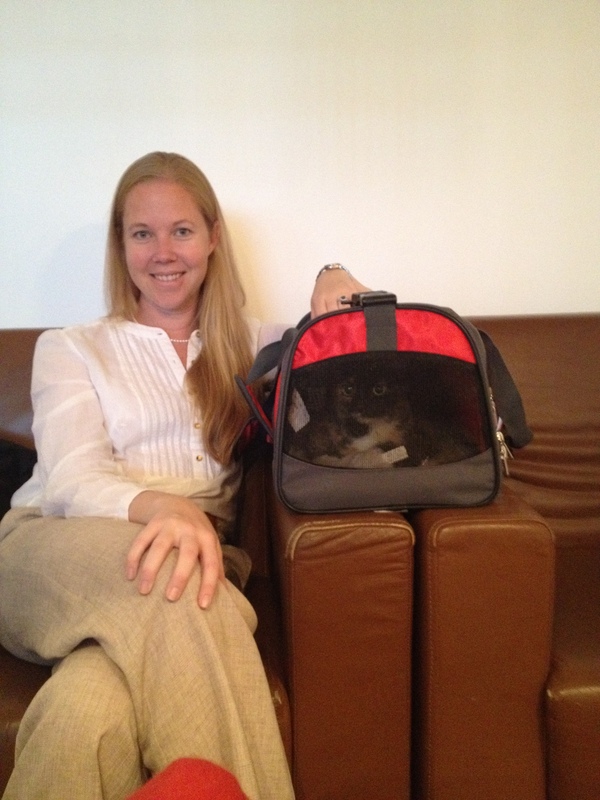 Find out what airlines allow pets in the cabin and what their policies are. For example we flew COPA Airlines, and according to their rules we could bring one cat per passenger (a maximum of two cats per flight) and only if a dog had not already been booked on board. However it seems as though airlines increasingly are not allowing animals into the cabin, which is a real pity, as it truly is the best way to travel for both you and your pet. 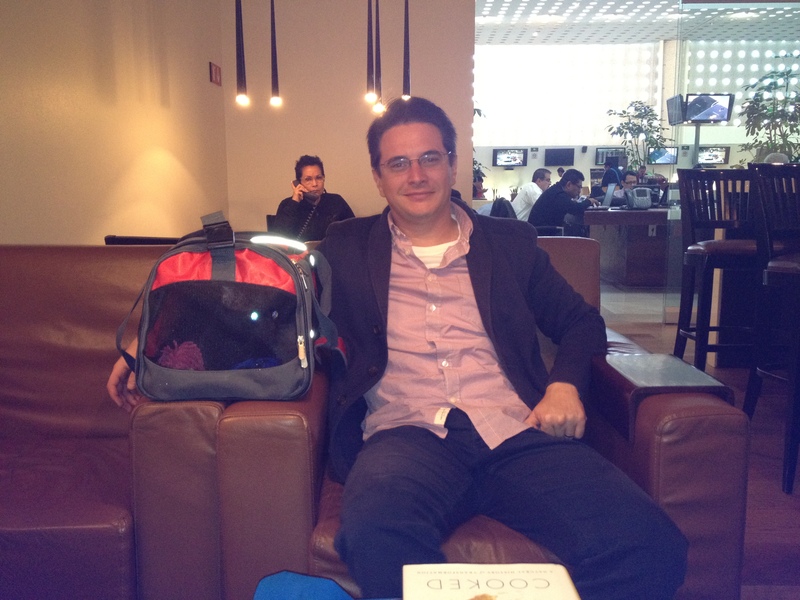 The bags are a convenient size, they have been made with air travel in mind (they fit all U.S airline requirements) and they do not look like animal carriers – the majority of people on the plane had absolutely no idea we had cats with us giving them a degree of privacy. However most importantly they are resilient. Pixie are little black cat became really agitated at one point, and starting clawing, biting and doing whatever should could to escape – but the bag withstood without even a tooth mark! Something that I would highly recommend to do which I think really worked for us, was that we bought the carriers at least a month before we moved, and left them open around the flat. The cats loved jumping into them and sniffing them, and on more than one occasion I found them both deeply asleep in their carriers. They liked them and associated them with our home. I noticed that when we moved into the hotel there was still an attachment to them, and Pixie especially, liked to jump into her carrier from time to time for a nap. 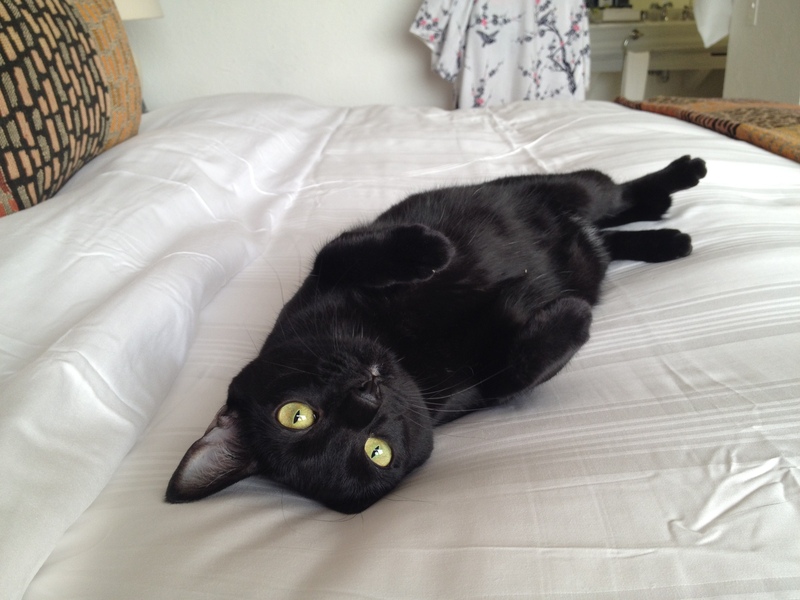 Cat Sedation: Do not do it! Although this used to be common practice it is in fact an out dated notion for normal and healthy cats. According to my wonderful and handsome vet (who incidentally is my husband…) sedating cats can actually cause more stress to them as it affects their natural ability to balance and maintain equilibrium. It is like being very drunk or very hung over on a plane…which I can guarantee you is not a pleasant experience! Go to the airport early: Our flight was at 10am and we were at the airport by 6:30am which I am really glad we did. Everything takes so much longer than you expect when you are flying with an animal. The check-in alone took us over 40 minutes, as they were checking our papers, re-confirming our information etc etc, and the last thing you want to be before your flight is stressed! Security: Something that never occurred to me until I was doing my research is that you will have to take the cat out of the bag to go through the x-ray machine and security. People who have cats, know what little squirmy and slippery buggers even the most lovable cat can be. So we clipped their nails the night before, and put a harness on them in the morning. Our cats hate the harness, but it gave us something extra to hold onto in case something really spooked them. Surprisingly things went rather smoothly. C scruffed them (held them by the back of their neck) and took them one by one through the metal detector. They were pretty frightened and kind of curled themselves up like a kitten and were more than pleased when they saw their carriers on the other side and were desperate to get back in. It was a relatively quiet period when we went through security, but I think the most important thing to remember is don’t allow yourself to be stressed out by other people. Going through security will take longer than normal. You are not just taking off your belt and shoes, and trying to find your liquids, you are dealing with a live and frightened animal! The Mexican security guys were fantastic, really patient and not pushy…I would hate to have to go through this in the U.S. where they tend to yell at you and treat you like cattle! Khloe looking alert yet calm! Find a quite spot in the airport, amazingly we were allowed into the AeroMexico Business lounge with them! Pixie on the other hand did not like one minute of this journey! The Flight: Not surprisingly the only time that both cats got really agitated and started making noise, was during take-off (this too is also when I get agitated!). But incredibly NO one heard them, or even noticed them. I kept looking around worriedly at my fellow passengers when the cats were meowing but not a blink, not a single reaction! Everyone was too engrossed in what they were doing, and did not even hear the cats. The guy next to us had absolutely no idea we had cats with us, it was only when we had landed that he noticed them. Once we were up in the air, both cats settled down for the duration of the flight. Every opportunity C and I got, we brought them up on our knees in the carrier and stroked and chatted to them, which I think really calmed them and reassured them that it was alright, and we were close by. Conclusion: Although the above sounds relatively easy and straight forward now, it was a difficult day for us. We were fraught was anticipation and worry, concerned that there would be something wrong with our papers and we wouldn’t be let out of or into the country, and it definitely was a day of hell for both Khloe and Pixie. BUT we got through it, and it was not as bad as I had imagined it to be. Now that I know what to expect and how well the cats managed, I will definitely not have as many sleepless nights before our next move unduly worrying about them. As I write this post, I have two very healthy and happy cats sleeping next to me. They both have settled in so quickly and so well into our new apartment, and neither of them seem at all damaged or traumatised by their experience. < Previous Brasilia: First Impressions! Next > Happy Birthday The Travelling Chopsticks! I think Ava would enjoy reading this.